If you came out to pre-race practice swim on Friday evening before the Luray International on Saturday, you likely Matt Shanks who was there to offer racing tips. Matt was one of the pros who raced at Luray International Triathlon this year for a chance at the $5,000 cash prize purse. 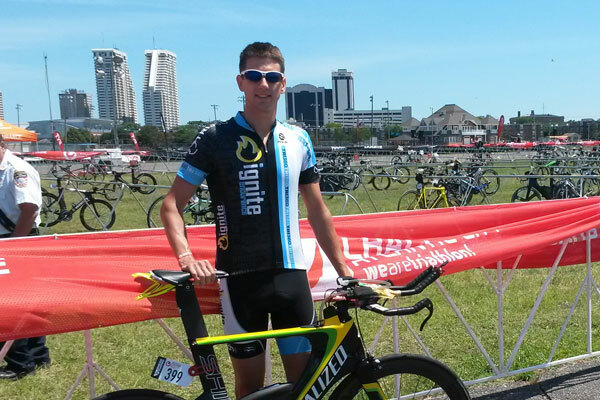 A member of the Ignite Endurance triathlon team, Matt is a long course athlete, focusing on Ironman distance races. 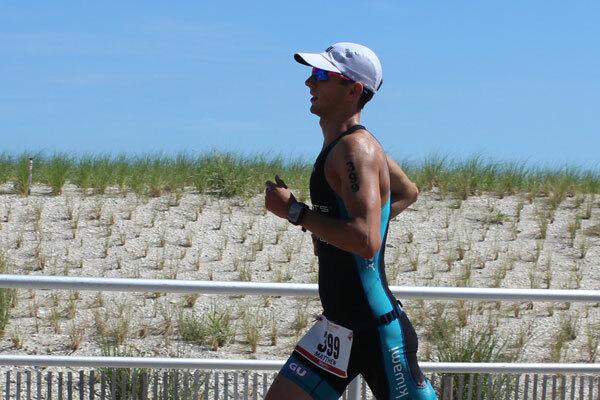 Most recently, he completed the inaugural Challenge Atlantic City where he earned his ELITE (pro) card with USA Triathlon. I started all three sports within a year, so I am one of the few who doesn’t have a much stronger background in one sport over the others. I first started triathlons in 2004. I trained fairly seriously for sprints and Olympics through high school, then had sporadic training and racing through undergrad. 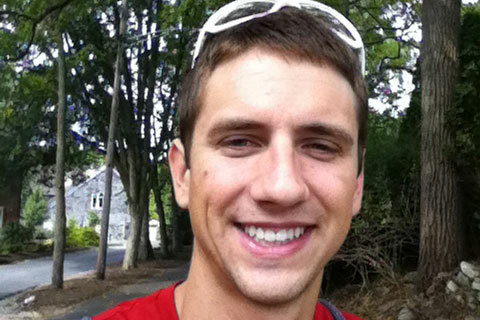 During grad school at Penn State, I got into long course racing and started training consistently. I’ve now raced 5 full distance triathlons, and just recently qualified for my USAT elite license. Swimming. I’ve been swimming for 10 years, but I still feel like a newbie anytime I’m in the water with a collegiate swimmer. Even though it’s my weakness I still enjoy swimming. It’s a challenge that I’m continually working on. Oh, also short course racing. I have no speed! But come to long course and I can motor along forever on my fat burning engine. Q: Why did you choose to race at Luray Triathlon this year? Well I’ve heard great things about the race from a few friends, scenic and well organized, which are always things to appreciate. I also made the race a camping and racing trip with my brother-in-law, who I’ve never raced with before. This was my first race with the potential to win a cash prize, so was pretty excited about that! Q: What else this season? My big races left for the season are Chattanooga Ironman and Beach2Battleship full triathlon. Keep an eye out for me! Q: Why do you like the sport? The opportunity to always improve, along with all the experiences that come with the training and racing. I love the feeling of getting fitter and faster and having that drive to improve. I also love being outside riding the backroads, seeing new places with all the travel for races, and meeting new people. The sport is fun but it’s so much better by including some camaraderie with a few training buddies. Q: Most helpful training tools? A coach and a power meter I think are the best investments for a triathlete. There is SO much to learn in this sport, and having a coach gives you that personal guild through everything you need to know. Sure, you can figure out a lot on your own, but it takes a lot of trial and error over a lot of time. Having a coach helps speed that up significantly. But, make sure you’re actually hiring someone who knows what they’re talking about. A power meter seems fancy at first, but really ought to be one of your most fundamental training tools. It makes the work load of training objective. It doesn’t do a whole lot of good though if you don’t know how you should be training though, hence the power meter and coach go hand in hand. I recommend PowerTap, mostly for cost and reliability. I urge you to get more involved in the professional aspects of the sport. I’d like to see the sport grow in all aspects, and I feel like the place it’s lacking most is the professional end, mostly in how little the races are spectated/followed. I find it very interesting to follow the training and racing of a few of the top pro’s, and I believe you would too. Check out Cal’s video’s if you’d like an introduction to some of the pro’s, with a bit of unique humor…. https://twitter.com/callummillward. Good luck with the rest of your racing season!